Women health camp has been conducted at ellikeshwaram (V) Mahadevpur (M) with co-ordination with chalimeda hospitals. Dr.Sri Bandarkar,Dr. Sri Kanth,Dr. Kumari Hindu and their team of doctors contributed their valuable service. Village sarpanchSriman Shekar garu,Sub inspector Sriman Krishna reddy,local MPTC,ZPTC attended and addressed the camp. 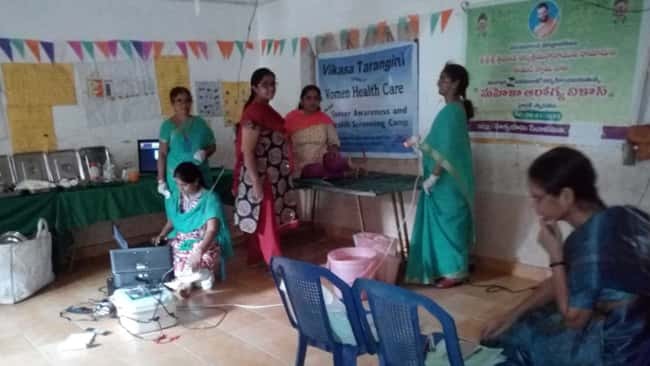 Vikasa Tarangini mahila camp incharge Sriman V.Ashok Rao,Sriman goutham rao(President),Sriman Yada Kishan(Secretary),Sriman Ravinder Rao & Vikasa Tarangini mahila volunteers extended their services in the camp.